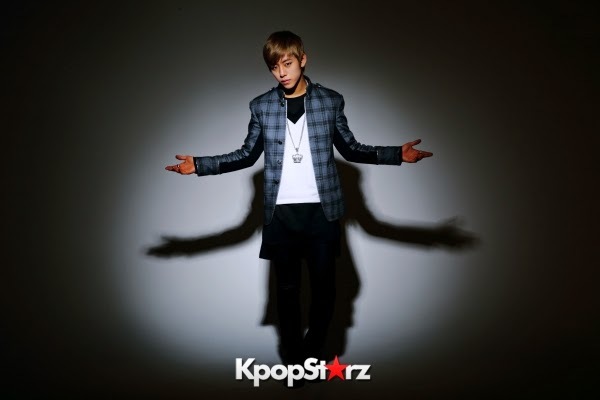 Part 1: Jongup is not good with heights? Hello. This is Matsumoto who handled the previous interview with B.A.P. We actually did the photoshoot at the studio, then the interview at another location. B.A.P is currently in Europe then to Australia for their world tour! They had the release of their 3rd Japanese single "No Mercy" as well as their first Japanese fan meetings before their tour started. When they came for their interview, what kind of atmosphere was it? What was it like on the sidelines of the photoshoot? In order to do some checking with the cameraman, I arrived early and could hear Daehyun's singing from the dressing room. The photos I'll introduce today are unreleased "Other cuts." In order to write this, the members said I could use these cuts of them. Alright, the photoshoot started. The members gathered in the the centre of the studio. When I greeted them "This is KpopStarz, I look forward to working with you!" they answered in Japanese "We look forward to working with you!" There were printouts of the photos from the last backstage report we did, and when they saw them the members said "Ah! These! I saw it I saw it!" "Eh, which one?!" "This! I remember this one! Hahaha!" (laughs) "We're not doing these photos today?" 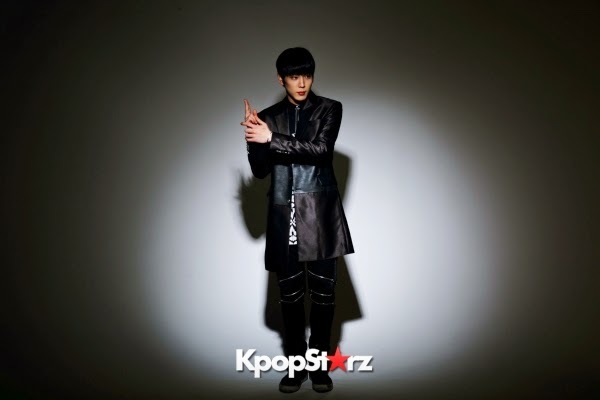 Zelo said, with excited, dazzling eyes as it seemed today would be more amazing. We're doing a different sort of shoot today, we'll do one like these next time! I explained. The first shoot was in front of the rolls of paper backdrops. 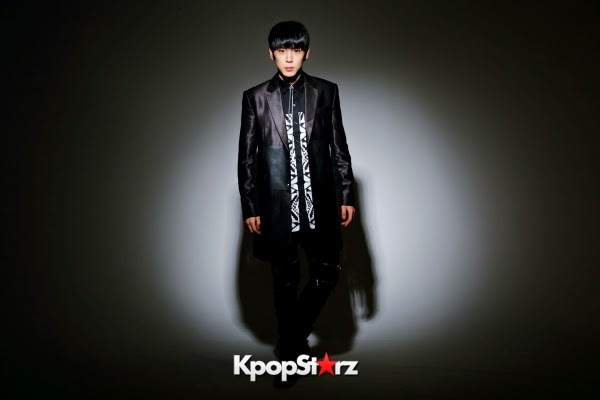 Himchan asked "What sort of feeling are you shooting for?" So I told them that "We're looking for an arty, stylish feel, so everyone look cool as well." They quickly changed gears and "focused." Without exchanging words, the members switched on to a focused mode. "Next we'll move outside to shoot on the stairs." Everyone moved. The stairwell was cramped, in order for all the members to be in the frame they were pretty packed in. We were completely unable to see the green of Yoyogi Park behind them (laughs). I met Himchan's eyes. I sensed, with that look, that he was asking "What feel are we going for?" With eye contact, I said "We're looking for a rough, relaxed feeling please!" …huh? 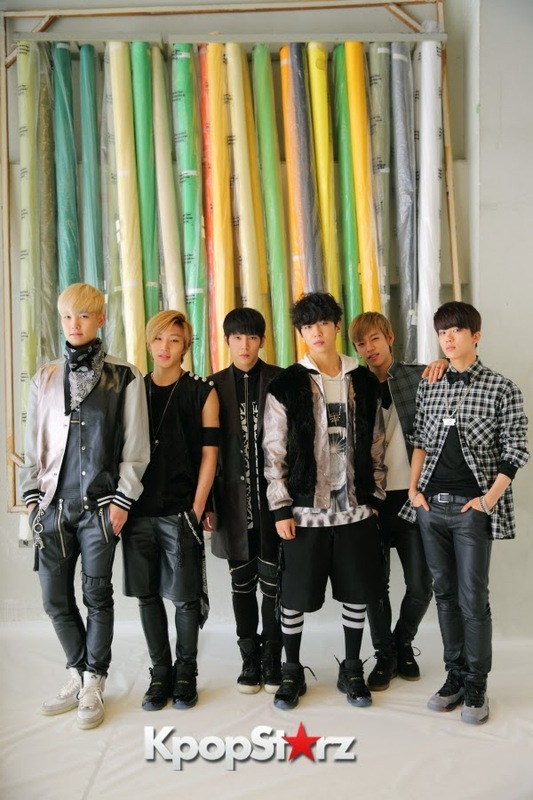 Why is Jongup moving awkwardly like that? "I want to be at the front…" he said nervously, making the members a wall [behind him]. It's because he's not good with heights! 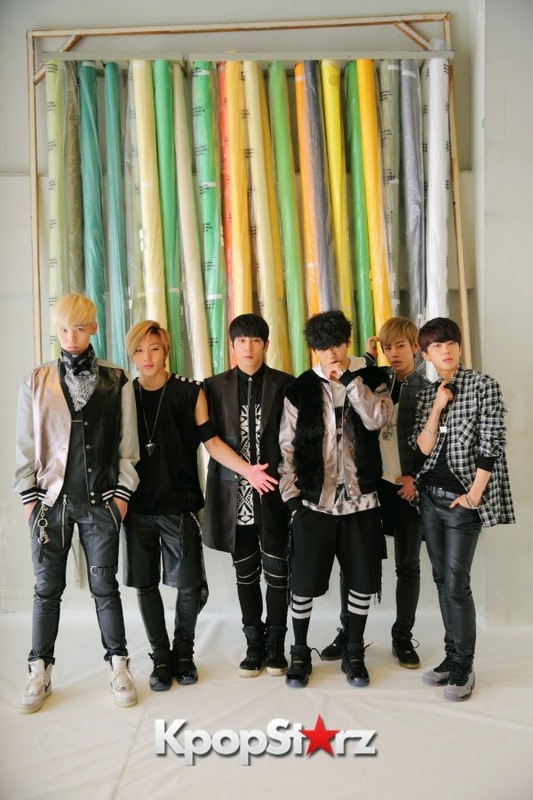 The members teased fearful Jongup, Daehyun pinched his cheeks saying "C'mon, smile!" while laughing heartily. 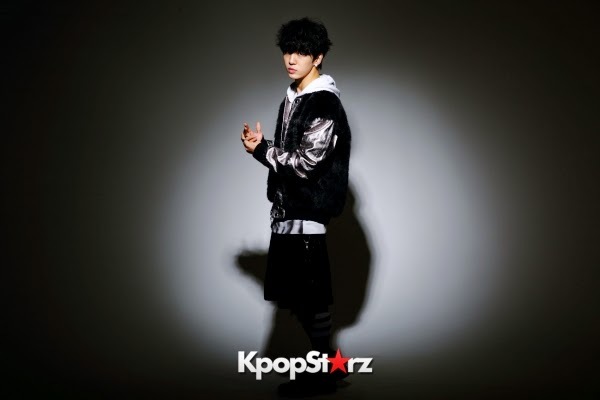 Part 2: Member personalities come out in their solo shots! 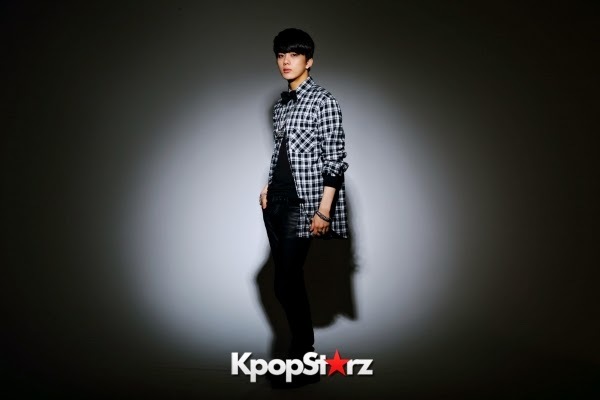 Returning to the studio, now for solo shots, starting with Youngjae. Saying that, it was also Youngjae who was the first one sitting for the interview in the evening. The lighting in the studio was normal, though there was a round light framing the person in the shot. Being unaware of the outlines, we showed him "This is how it'll be shot," and when he saw it Youngjae said "Wah, this sort of feel. I got it!" At first he went with a cool look, then a bold boxing pose, as well as a pose as if he was holding a gun! Also this! Zelo saw that and was next to shoot. It seemed as if he was unsure what image to go with, so at first he kept with a pretty, ballet-type movement pose. It seemed he enjoyed this, after repeating the ballet pose, he did his specialty, dance movements. His movements were fierce so he was outside the frame several times, but right after shooting he requested "I'd like one of my solo shots, could I have one?" I am shooting different artists nearly everyday, hearing "I'd like a photo" made me very happy. Of course I gave him one the next day! 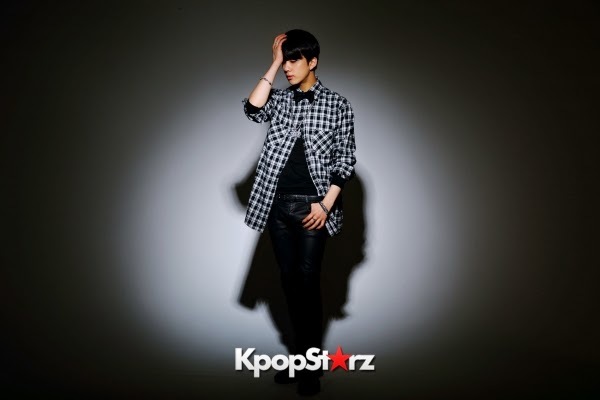 Third was Jongup. Just when he raised his arms, the muscles…! In the middle of shooting, he seemed to wonder what sort of pose to go with next, so I said "Jongup, I request your "1004" starting pose!" While he sort of laughed, he did his flexible pose. From that point, the atmosphere changed. 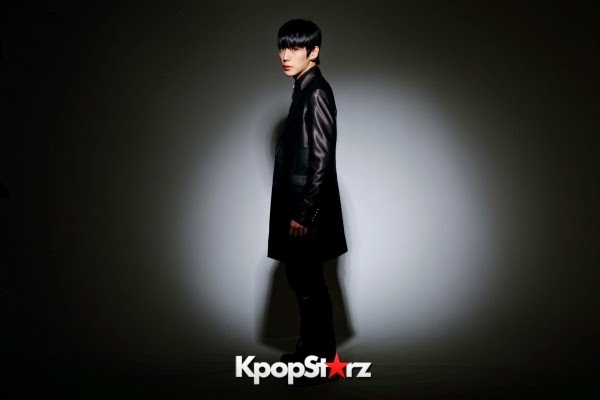 While Himchan commented "What sort of pose is good?" …suddenly this pose! "Maybe this 007?" (laughs) With some hesitation (laughs), it was a cool shoot. 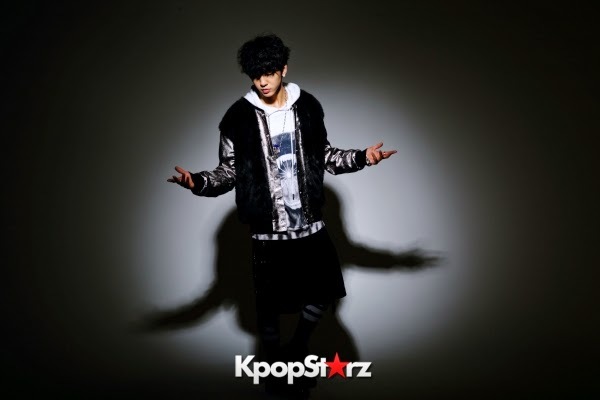 Continuing on was leader Bang Yongguk. He has a unique rhythm to his movements. Seeing his vibrance during shooting I wondered if there was music playing in his head as well. 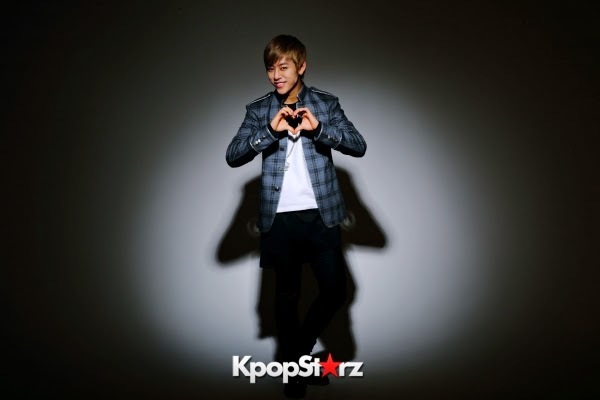 The last for the solo shots was Daehyun. I think this each time, but his face has the power to melt everything. "I think fans always want to look at your face!" I said, and he replied "Really?" with a smile. Then posed! Time up. This shoot is finished. This photoshoot backstage report is also done. 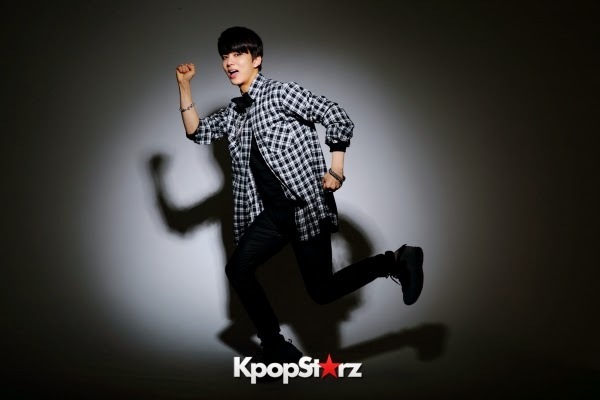 Thank you B.A.P for always doing promotional shots for us! Fans around the world are waiting for your concerts, and we'll meet you in Japan and enjoy your concert after you've become even bigger! B.A.P is currently on their Live on Earth Continent Tour which takes them to 4 American cities, then they're off to London, Paris, Dusseldorf! Before their 3 month long tour they released their 3rd Japanese single "No Mercy" and had their first Japanese fanmeetings. The single also reached #2 on the Oricon chart, combining their popularity and talent they are a group to watch! We had an interview that ranged from fun to serious, about music, the world we live in, world peace, they are a group with unlimited scope, 6 members with strong beliefs! Q: Hello. Your last shoot with us was very popular. Q: About your Fanmeetings. You held them in Sendai, Osaka, and Tokyo, please let us hear your thoughts about them. 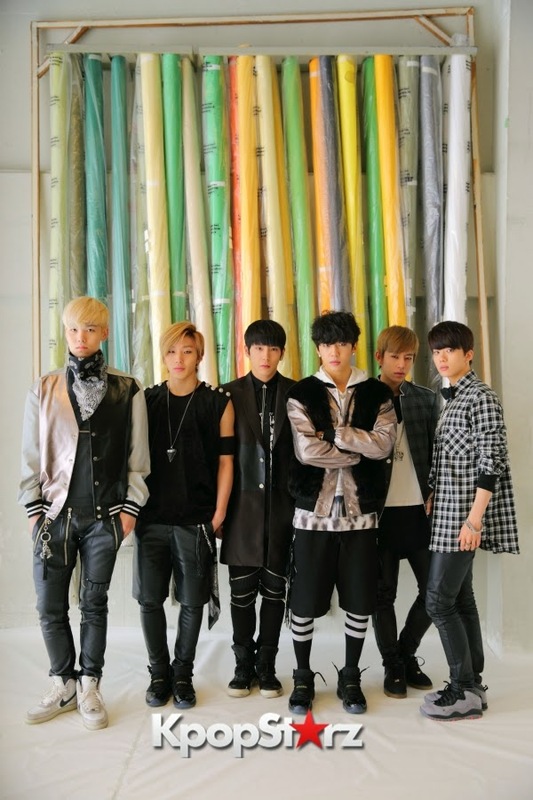 YJ: I felt it going to these different areas of Japan, but I had the feeling that "there are actually fans who like B.A.P and came to see us!" so I feel very thankful and happy that we had fun together at the the fan meetings. Q: It was your first time in Sendai? All: (all In Japanese) Our first time yes. Z: We ate beef tongue! Q: Did you all eat delicious local specialties? All: (Japanese) Yes! We did! HC: We ate at a famous Okonomiyaki shop in Osaka. D: (Japanese) Aah~yeah we did! D: (Japanese) I love it! HC: (Japanese) Yaki soba [stir fried noodles] was also good. I love it! Q: You celebrated Yongguk's birthday at the Tokyo fan meetings. Q: Do you guys exchange presents or anything? HC: Before we'd celebrate together. But lately it's difficult being so busy, now we say "Congratulations!" with feeling. D: Afterwards, we also ask if there is anything a member wants or needs and say "Next time we will buy it for you, ok?" and then buy it for them. Q: Yongguk, this time did you receive any present from the members? D: But I gave him a present last year! Q: You sang "No Mercy" for the encore of your last Tokyo fan meeting, but after that for the ending you became one with the venue and sang it once more with a lot of feeling, didn't you? HC: (Japanese) Yes, it flowed into that nicely! D: I think it was our last fan meeting, our members were in high spirits, and fans matched that so that was the outcome. Part 2: Continent Tour theme "What Earth Needs"
Q: Continuing on, about your 3rd single "No Mercy" now. For recording this time, was there any Japanese that you heard for the first time? YJ: Me too, "Inexperienced zone"
YG: (crooning) ♪Picking and choosing but we are the main! Q: Any favourite parts of the lyrics? D: (Japanese) In my part, "Let's create a new era" is good. The meaning is good. JU: (Japanese) "I'll take you with me, put your hands up"
Q: On that note, if we were to say "Let's go to karaoke together!" 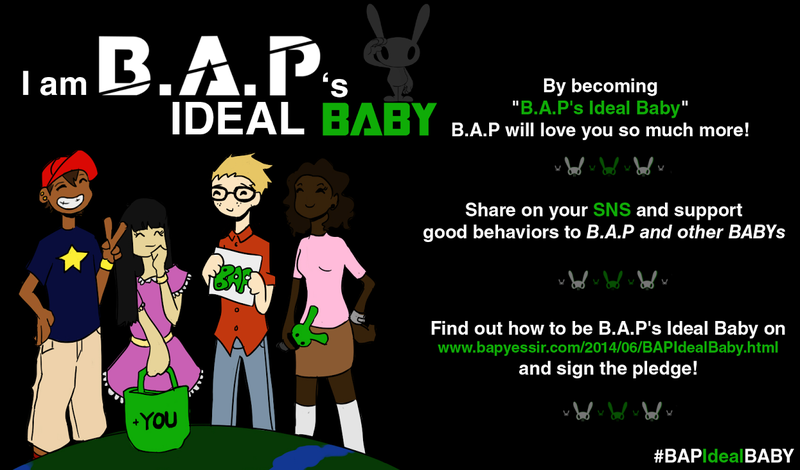 right now, out of all of B.A.P's songs what song would you sing first? HC: I like sensitive songs, so "Coffee Shop"
Q: There were many fans who watched the live viewing in Japan for your Live on Earth 2014 Seoul concert. I also watched it. Tell us about that concert. HC: How was the live viewing? Q: Since the camera focused on the one who was singing, we weren't able to follow our favourite member, but we were able to see you really up close which we couldn't do at a concert. I especially felt Youngjae's emotional solo corner. HC: Thank you very much for the valuable feedback. Q: So, how was your Seoul concert? YG: We're really excited since our Continent tour has started. We have done our best to prepare for this tour, so if a lot of people take interest in it we'll be happy. Q: About the theme "Earth Needs Justice, Love, Passion, Happiness, and you," how did you choose this theme. YG: Ok. We exchanged ideas at meetings between our members and our team in charge of our performances, and we decided on the theme then. Q: B.A.P always has a theme that is directed to the world. When did you start thinking about "The world" and "world peace?" YG: Before we debuted, our group concept was that we came from another planet. Now that we're on this planet, Working towards a peaceful planet, we protect the peace of the world. We are also determined to continue this. This way, we have been thinking about "World Peace" since the beginning with our debut. Part 3: America, Europe, then Japan from June for Live on Earth! Q: This is a question from the English KpopStarz. Your Continent tour will take you to America, is there anyone you would like to produce [music] with? YG: Pharrell Williams. I personally think that it would be interesting to do music that B.A.P has not yet tried, so I'd like to try making pleasant music with Pharrell Williams. Q: Your Continent tour will take you to Europe, is there anywhere you want to go or see? D: It's my first time in Europe, so really anywhere is good, I want to try going to many places. For us, since Europe is new to us and it will be a new experience seeing what kind of cities there are, we want to see many different things that we have not seen before, if we have time. HC: In london, I want to go to the Beatles' Abbey Road. The reason is that, before we released the song "Goodbye" in Korea and on the jacket cover, it wasn't us but our Matoki walking on Abbey Road. Next time I want us to try walking there. Q: The Europe leg of your Continent Tour starts April 27th, a message for your European fans please. Q: Also, Japan "Live on Earth" is in sight! HC: We can't say too much about it, but we want to go to many cities and meet a lot of fans. D: More than the image we showed for our last tour, we are able to show an evolved look. We want to show our BEST stage with no regrets. Q: With the release of your Korean single "1004 (Angel)," you fulfilled your promise of doing volunteer work once you took 1st place on a music show, right? All: (cheerfully) Yes! We did. YG: We actually just went before this interview. (Himchan shows pictures from his smartphone) We volunteered at this place with fans, our agency staff, and we worked with children with disabilities. We fed them, gave them baths, got them ready for sleep, helped with a birthday party, and read them stories as well as singing songs to them. Q: What volunteer work does B.A.P want to do next? HC: We want to build a school in Africa. YG: Also, we built a school in Cambodia but we feel that it was built by all our fans. From this point on, we want to continue doing our best.